What is a “Structural limitation to growth”? How can I exploit it? The ageing of the populations within, for example, the US and UK is a structural limitation to the growth of the economy. (See “isn’t the consumer dead?” for an insight into the amount of the country’s net wealth this part of the population account for and the degree to which they are ill-prepared financially for retirement). 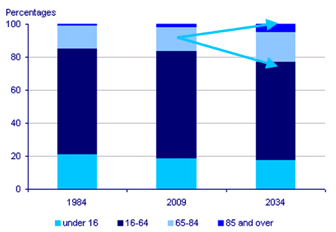 Within the UK, the percentage of the population aged over 65 (retirement age) increased from 15% to 16% from 1984 to 2009, over the same time span going forward this is to increase from 16% to 23% by 2034. This is a substantial decrease in the percentage of the nation generating an income, spending and boosting the economy and instead increasing the proportion of the populace reliant on healthcare, a state pension and other costs to the government. The importance of the consumer and the concerns surrounding the structural headwinds they face are undeniable. Consumer spending accounts for approximately 70% of US GDP (although I’ve read an interesting piece by Darren Marron arguing this figure is actually nearer 60% when spending on imports are dealt with more appropriately but nevertheless, this is still a significant percentage). The magnitude of the problem has been well described by John Maudlin who pointed out that versus the last recession, we have seen “double the asset deflation, triple the job loss, coupled with a collapse in credit.” It doesn’t look likely that the consumer will be bouncing straight back! On the subject of unemployment, although it is universally monitored, what has been missed by many is what the rate does not take into account. Salaries have been cut and working hours reduced. This adds to the misery of many consumers. Furthermore, it is these people who are working part-time that will be hired back into full-time employment before companies reach out to the many unemployed. This must be assessed within the context of an expanding labour force where a substantial amount of new jobs are needed every month in the US. ECONOMIC IMPACT: This points to a muted recovery instead of a “V” shaped bounce-back. INVESTMENT INSIGHT: Look at companies which aren’t as heavily reliant on the Developed Consumer but with an international reach and operations within Emerging Markets. To exploit the ageing of the “Baby Boomers” within Developed Markets, see What is a \”structural limitation to growth\”? How can I exploit it? and invest in companies positioned to benefit from an increased reliance on healthcare, nursing homes etc.